Gentry is a one stop shop for some of the best menswear products in New York. The Brooklyn based retail shop stocks eclectic, high fashion pieces from the likes of Junya Wantanabe and Comme Des Garcons that tie hand-in-hand with industry inspired workwear brands such as Engineered Garments and Post Overall’s. Other brands, such as Our Legacy, Visvim, and Nanamica, are laced within the profile of what Gentry has to offer. They have recently re-located, and opened up a pop-up shop that hosted all of Gentry’s goodies until the brand new shop was finished. Gentry's new location on North 7th St. Williamsburg, Brooklyn has opened it's doors, and we were able to catch up with Justin Dean, the store manager, buyer, and stylist for Gentry’s photography work to ask a few questions about his store experience and creative process. MS: How did you begin your career in fashion? Can you pinpoint where your creative interest stemmed from? JD: My background is in philosophy and art. I see fashion as existing within a larger aesthetic context. I am a big fan of Stanley Kubrick, and the work that Milena Canonero did on Clockwork Orange. Barry Lyndon and The Shining stood out to me at a very early age. She has also done beautiful work for Wes Anderson, Francis Coppoloa & Steven Soderbergh, and is a constant source of inspiration for me. But, seeing those Kubrick films put me in tune with clothing, and how that can express the soul of a person. MS: How would you describe your personal style? 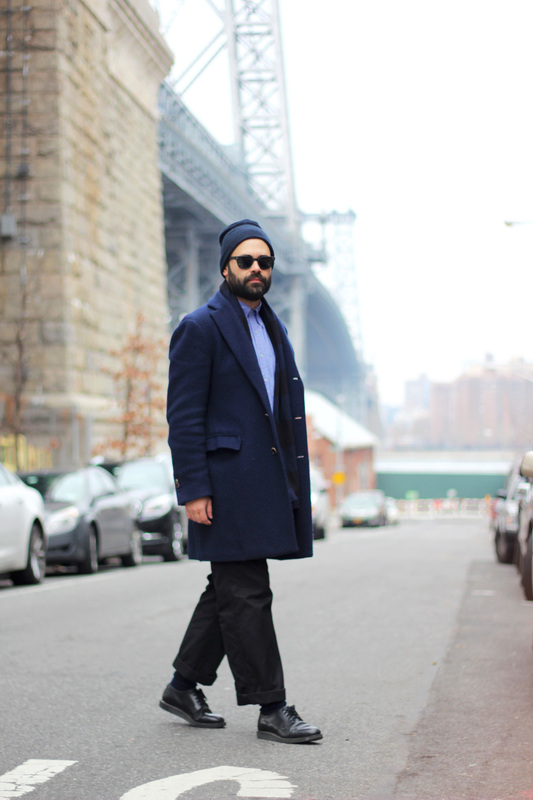 Jd: I wear a mix of Comme des Garcons, Yohji, Junya, Dries and Engineered Garments. I like to mix high and low, luxury and street. MS: Justin, you dabble in all sorts of fields within the menswear industry. Where do you find inspiration for buying, managing, etc? What mediums other than fashion do you find inspiration in? JD: Creatively, I find inspiration in painting, film, music and the streets. New York is filled with diversity, creativity and a practicality that I find endlessly inspiring. In running a business, Gentry allows me to use both sides of my brain. It is a creative endeavor but it is also, at the end of the day, a business as well. MS: One of my favorite things about Gentry is your strong product and editorial footage. Can you speak about the importance of a good visual presence within the industry? How do you approach the styling of your editorial shoots, as well as the stories told within them? JD: In our editorials e want to express our love for the clothing and give a sense of how it would be worn in the street. We love mixing the creative and the practical, the high and the low. The visual presentation is essential in that it expresses the way the clothing looks, feels and moves. MS: We spoke about Gentry steadily finding its unique and individual aesthetic within this ever-crowding menswear world. Can you tell us why Gentry separates itself from the pack? JD: We want to keep it simple while expressing our love for clothing, and to express those pieces from a New York perspective. MS: The folks at Gentry and yourself have been working on a new space opening in the spring just a few blocks from the current pop-up location. Can you give us some insight on what the new space will offer as far as design, product mix, etc? JD: Black & white palette, with minimal design that allows that clothing to shine. And good beats. MS: What are some of the most important things you have learned during the evolution of Gentry and you time involved within the fashion game? What advice would you give to those trying to get involved? JD: Even with change there must be a sense of direction. Know what you want to do; stay true to what you like; and learn to improvise within that.